So I recently picked up the Mavic Pro to add a new perspective to my photography. After some short flights from my front yard, this is quickly becoming my favorite camera and here are some of my first impressions of this drone. To start, it's incredibly easy to fly. The controls are intuitive and it's so compact that it's really easy to bring around anywhere. It flies incredibly smooth and stable as long as it's not too windy out. It's so solid that you can even do some long exposures while the Mavic hovers in the air. So far, the only downside that I have for it is that the low light performance is not that great and the noise creeps in pretty quickly once you start raising the ISO past 400, but it's kind of expected due to the size of the sensor. All in all, its a very minor trade off for all of the other features you're getting with it. If you're in the market for a drone, the Mavic Pro is definitely my top choice due to how small and compact it is. It will easily go with me in my travel bag when I take trips and it gives me a completely different way to take photos. Lately whenever my friend Linda comes to town, we try to do photography related activities since she has been learning more and more about photography. We recently went out and to capture a few long exposures from a nearby rooftop with a great view of downtown. We then hopped around to a few more spots so Linda could get more familiar with her new tripod. 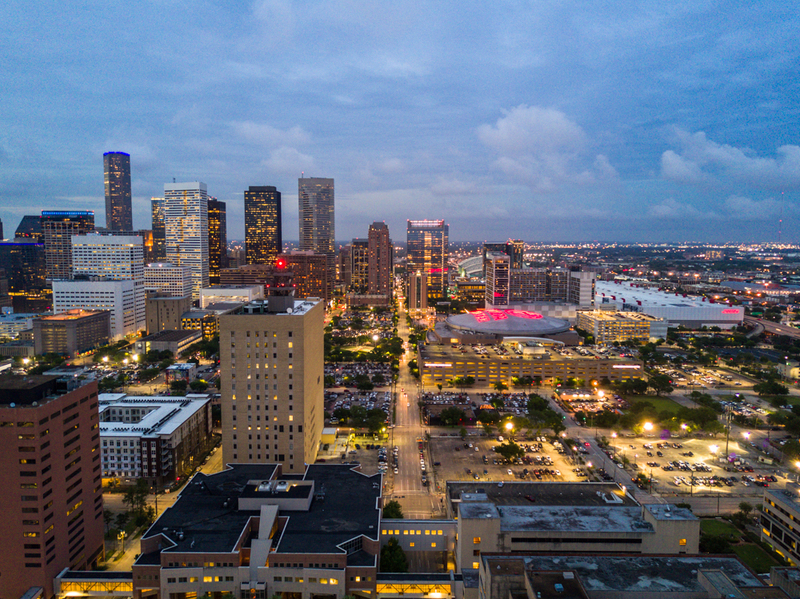 Here are a few pictures from the first time we went around to a few spots around downtown Houston. Growing up in suburbs of Houston, I didn't come to downtown Houston much, so I never got the impression that Houston had the big city, New York or Chicago skyscraper feeling. I have lately been getting more into cityscapes and now that I'm more familiar with the city, there are definitely some impressive views to be had. Every year around Thanksgiving, Linda, Kim and I have a day together pursuing adventure and art. One year, we filled a red phone booth with pink balloons, had a photoshoot and watched as passersby smiled at the sight. Another year, we made paper cranes for Kim's Christmas Tree. It's a fun tradition that we now call Day of Magic. This year, we drew inspiration from looking at hashtagged photos of Houston. We found several photos taken from amazing heights and vantage points. Thus began our search for rooftops around downtown. To start, we had a short jaunt around Bruce Munro's Field of Light in Discovery Green. Since Linda is a budding photographer, I had a few short lessons with her on long exposures and using a tripod. We then "snuck" into a rooftop lounge of the Hilton that gave us exactly the kind of view we were looking for. We hung out for a bit, while I got some wonderful shots of the city along with some great timelapses.